About our musical instrument cases. We sell only the kinds of cases that offer the best value for the dollar. We sell cases by Bobelock, Concord, Eastman and Protec. Bobelock has a proven track record of not only the best quality, but maintains the reputation for "the most case, for the dollar". They offer a wide range of levels and prices, but for each price range, their cases prove to be the best performers: Longer wear, practical storage spaces for rosin and music, etc.. and also again, they beat everyone when it comes to real value. 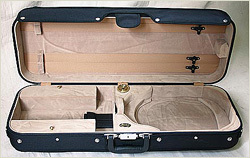 Shipping violin cases usually takes 3-5 days to deliver and shipping is no more than $15. We take Visa or Mastercard. Shaped style like a viola in black zippered cover. Heavily padded interior with 2 bow holders. Velour linings in blue, green, or wine. Case strap included. Classic rectangular cases in the adjustable format. Comes in wine, blue or green interior. Only black exterior. 4 bow holders, case strap and suspension. 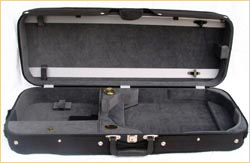 Case adjusts from 15-17" and fits violas up to 260mm wide. A new lighter arrow shaped case with suspension. It comes with case strap, music pocket, large interior pocket near top of scroll. 2 bow holders. This is a popular case because of the huge color combinations (see below) and half-moon (or crescent) shape. It is smaller and slightly lighter than the regular Oblong #1005. 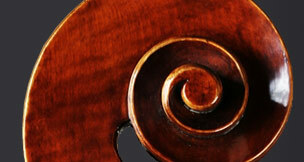 Has exclusive adjusting system that fits Violas up to 260 mm wide. Case strap, 4 bow holders, suspension pads, hygrometer, blanket, string tube and music pocket on the outside part of the cover . Fiberglass, glossy cover, velour int. Black exterior with wine, blue or green interiors. Oblong styrofoam reinforced with fiberboard and plywood. All cases have 4 bow holders, an outside music pocket, case strap and blanket.